So you love spring cherry blossoms but not the mess the fruit can make. 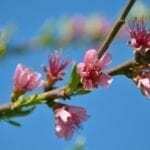 Try growing a Kwanzan cherry tree (Prunus serrulata ‘Kanzan’). Kwanzan cherries are sterile and do not fruit. 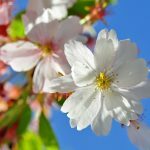 If this double-flowering Japanese cherry sounds perfect for your landscape, read on to find out how to grow Kwanzan cherries and other Kwanzan cherry tree info. If you’ve been to Washington D.C. in the spring, you’ve no doubt been in awe of the numerous flowering cherry trees lining the avenues. Many of these beauties are Kwanzan cherry trees. Not only are they stunning in the spring, but they lend beautiful fall color and the trees are sterile so they do not produce fruit, making them the perfect specimens along roadways and sidewalks. 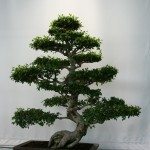 Native to China, Japan and Korea, the tree’s original name is ‘Sekiyama,’ but it is rarely found under this name. Kwanzan (also known as Kanzan or Japanese flowering cherry) cherries were first donated by the Japanese people in 1912 along with 12 other varieties of flowering cherry. Considered to be one of the most ornamental of the flowering cherries, the cherry tree grows to around 25- to 30-feet tall with an overall lovely vase shape. The deep pink, double blossoms bloom in clusters of 2-5 in April, just prior to leaf emergence. The tree has dark green, serrated, 5-inch long leaves. In the fall, this foliage changes from yellow to an orange/bronze tone. Kwanzan cherries are adaptable and can be found thriving along sidewalks, roadways and even as container plantings. You can also try your hand at growing a Kwanzan cherry tree as a bonsai. The biggest downside to growing this cherry ornamental is its limited lifespan; the tree doesn’t exceed 15-25 years. That said, its stunning beauty and minimal care make it well worth planting. Kwanzan cherries can be grown in USDA hardiness zones 5-9 and should be planted in an area that receives full sun for at least 6 hours per day. The tree tolerates acidic, alkaline, loamy, sandy and both well-draining to wet soils. It prefers regular irrigation, although it is somewhat drought tolerant once established. Kwanzan cherries will also tolerate summer heat and humidity. Although Kwanzan cherries are mildly drought tolerant, they prefer plenty of moisture. When caring for your Kwanzan cherry tree, be sure to give it adequate irrigation and avoid other stresses, as the bark is thin and easily damaged. Kwanzan cherries are susceptible to a number of pests, including aphids – which result in sooty mold. Borers, scale bugs, spider mites and tent caterpillars may afflict these flowering cherries as well. Kwanzan cherries may also be afflicted by several diseases. Diseased branches should be pruned out but, otherwise, Kwanzan cherries need little pruning.